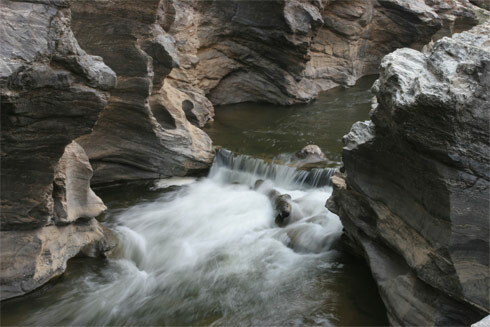 Ob Khan national park is one of our favourite local getaways. It’s about 30km South of Chiang Mai, and takes between 45 minutes and an hour to reach by motorbike. It’s a great spot for a picnic, or simply to cool off on a hot and humid Chiang Mai day. You can in fact also camp there very cheaply – they will even rent you camping gas cookers to cook with. Getting there: Just head out of Chiang Mai South down Canal Road towards the Samoeng junction, and carry on. After a few more kilometers (at the time of writing down alternating sealed and unsealed dusty roads) you reach a turn off on the right with a fairly hard-to-see sign to ‘Ob Khan National Park’. Take this turn off, and make your way along a winding road through villages and country side for about another 10 kms. The last few kilometers wind their way through some beautiful National Park hills and valleys alongside the river Khan. Chaing Mai, Chiang Mai, or Chang Mai – how to spell it!